, a new pilot program that helps shoppers identify online merchants that offer a great shopping experience. The Google Trusted Store badge is awarded to e-commerce sites that demonstrate a track record of on-time shipping and excellent customer service. 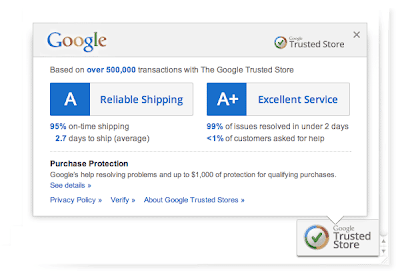 When visiting a qualifying store, shoppers can hover over the Google Trusted Store badge and see metrics on the store’s shipping and customer service performance. To participate in the program, merchants voluntarily share data about shipments, and Google collects customer service metrics when shoppers seek Google’s help with a problem. When a shopper makes a purchase at a Google Trusted Store, they have the option to select free purchase protection from Google. Then, if a problem arises with their purchase, they can request Google’s help, and Google will work with the merchant and customer to address the issue. As part of this, Google offers up to $1,000 lifetime purchase protection for eligible purchases. Starting today, you’ll begin seeing the badge at a handful of online stores, including O.co, Wayfair, BabyAge.com, and Beach Audio. During this pilot, you may occasionally see a different version of the badge on these sites - or no badge at all - while we perform tests to measure the impact of the program. Over the coming months, we plan to expand the program to include more stores. If you’re an online merchant interested in participating, please fill out this form. To learn more about Google Trusted Stores, visit www.google.com/trustedstores. One of the great things about online shopping is that it offers the opportunity to find just what you’re looking for, at a terrific price. But, shoppers often tell us they’re nervous about purchasing from unfamiliar online stores. Is this store trustworthy? How reliable is their shipping? Do they have good customer service? What happens if something goes wrong? Today we’re announcing the launch of Google Trusted Stores, a new pilot program that helps shoppers identify online merchants that offer a great shopping experience.